Editor's note: This interview is a translated version of the interview that was first posted on August 9, 2011. 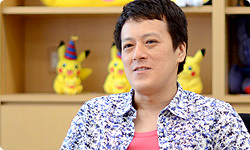 The interview about Pokédex 3D referred to will be available soon on this site. 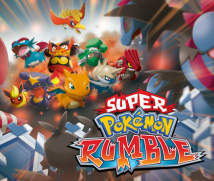 Now that we have discussed the Pokédex 3D application, I would like to ask about the game Super Pokémon Rumble. Thank you for coming. 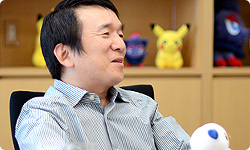 First, Ishihara-san, would you tell us what you did for Super Pokémon Rumble? Sure. Thanks to the fans’ long support of the previous game, the WiiWare1 game Pokémon Rumble2, I was quite satisfied with it, so I had a strong desire to bring a sequel out for the Nintendo 3DS system. The only people who could achieve that were Ambrella3, so my job was saying to them, “You’ve got to make this for Nintendo 3DS!” (laughs) 1WiiWare: The service where users can purchase and download new Wii software, that is not available in shops, to their Wii console via the Internet. The service began in Europe in May 2008. 2Pokémon Rumble: An action game available for purchase and download as WiiWare from the Wii Shop Channel in Europe since November 2009. 3Ambrella Co., Ltd.: A video game developer established in 1996 in Tokyo. In addition to Pokémon Rumble, they have made such games as Hey You, Pikachu! (Nintendo 64), Pokémon Channel (GameCube), and Pokémon Dash (Nintendo DS). Yes. (laughs) And now to you two from Ambrella who accepted that request. Who shall we start with? I’ll go first, I’m Matsumura. 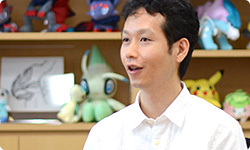 When you started, you had the foundation laid by Pokémon Rumble, so you had a clear idea of what kind of game to make, and that made development easier this time. I’m Ozawa from Ambrella. This time, we were moving from Pokémon Rumble, which was WiiWare, to packaged software for the Nintendo 3DS system, so our target at Ambrella was to make something with impact. 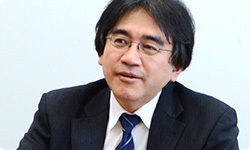 The scale of the project became larger, so we had to communicate with Ishihara-san and Nintendo more often. I listened to the opinions of the staff at Ambrella, and served as a sort of coordinator. 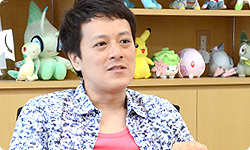 Matsumura-san, some of our readers may not be familiar with Super Pokémon Rumble. Could you tell us a little about what kind of game it is? Alright. Pokémon are creatures that battle. In the main series of Pokémon RPGs (role-playing games), you use commands to fight, but in Super Pokémon Rumble, you battle in real-time. The Pokémon appear as toys... Well, they crash into each other in real-time. Yes. It’s labelled an action game, but it doesn’t require anything too difficult. It doesn’t demand any mind-blowing button pressing techniques. That’s right. You move with the Nintendo 3DS +Control Pad or Circle Pad. The A Button and B Button are for moves. And that’s all. Like that. It really is that simple to play. When it comes to controls, it’s pretty straightforward, like games from the days of the NES era, so it’s an action game that you can feel comfortable playing. It may be like a NES game in style, but it draws on the increased power of today’s hardware. Yes. Over 200 Pokémon appeared in the WiiWare Pokémon Rumble game, so it’s a jumble of lots of Pokémon fighting and presented in a way that’s representative of the Wii console. The players can only use one Pokémon at first, but you crash into the Pokémon you meet, then defeat and befriend them. And you rapidly become able to use the Pokémon that are now your new friends. Over 200 Pokémon is quite a number. So adjusting them all was tough. When players who enjoy the main Pokémon RPGs see the Pokémon they encounter in this game, they make all kinds of new discoveries with regard to the moves they can use. I think it would be great if this series served as a sort of introduction to the broader Pokémon series. Earlier, Matsumura-san said that this is an action game you can play comfortably, but at first we didn’t think we could make a Pokémon action game even if we tried. You didn’t think Pokémon were suited to the direct controls of an action game. That’s right. 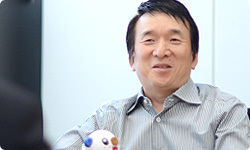 But when we made Pokémon Rumble as WiiWare, we came up with the idea to make them wind-up toys, which worked, and as a result, we made something that everyone could play. It’s an action game with simple controls, so you felt like it was accessible to all. I guess there are lots of people who back away just by hearing the words “action games”. But those people are among our customers, too. But my wife really liked playing the WiiWare Pokémon Rumble game. Only Pokémon Rumble. Each day, she would befriend a few new Pokémon, move on to the next stage, and say, “I wonder if I’ll get a stronger one!” She just keeps on going. Why do you think she can keep making progress? She isn’t so much playing an action game as she is enjoying popping bubble wrap. Yes. There was a mode last time called Battle Royale. Lots of Pokémon come out on one screen, and you fight until only one is left. That’s what she played. It’s fun for her to just hit buttons to somehow be the last man standing. When you just pound buttons, you eventually get tired of it, but Ishihara-san’s wife has been able to keep going for a long time. Why do you think that is, Matsumura-san? Hmm... Actually, when we started making Pokémon Rumble for WiiWare, the balance of the moves was off, and there was a relatively long period when people within the company weren’t crazy about it. Well, we thought we could take care of it anytime, so we said, “We’ll handle that later!” (laughs) But no one liked it, so I sneaked into the company during the weekend and sorted it out. Yes. (laughs) Then everyone suddenly took to it. When I played it, I could tell there was a clear improvement between the before and after versions. The rhythm and pacing really improved. That may be one reason she can play for so long. And it’s a game with depth. Even if you just punch buttons at first, you gradually pick up all kinds of moves, and as a result, go on a sort of “quest” to find slightly better Toy Pokémon. Once you get absorbed in that, you can play forever. And that’s what your wife does.